Kirkland, Washington – September 18, 2018 – ALMAX, a global leader in the design and manufacture of electronic switch technologies, announced their Tucson, Arizona manufacturing plant has registered with the DDTC and can now maintain ITAR compliance when supplying components to USML prime exporters. ALMAX owns multiple manufacturing plants including plants outside of the United States, so the ITAR compliance can only be maintained at their Tucson, Arizona manufacturing plant. The ALMAX Tucson location, also called the ALMAX RP Division, has a core focus on supporting rapid prototyping for US-based customers. Adding the ITAR compliance to the Tucson plant now gives customers access to ALMAX’s engineering and prototyping expertise when sourcing components destined for USML products. 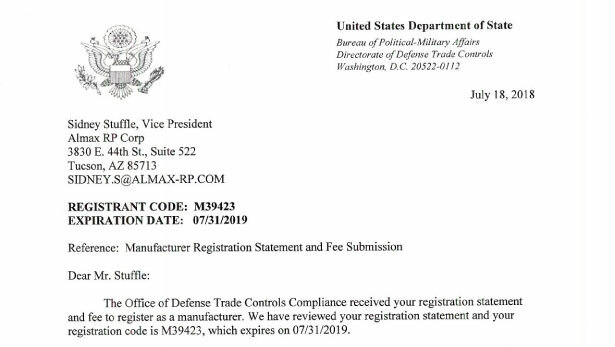 Please email info@almaxeis.com if you would like details on ALMAX ITAR compliance or a copy of our registration letter.